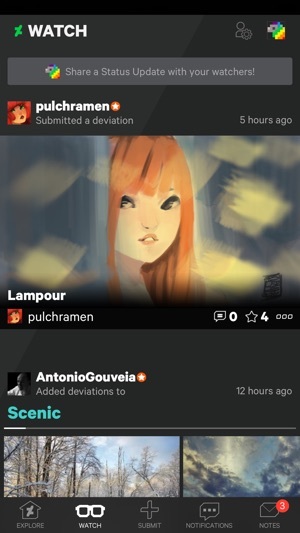 DeviantArt is the largest online social community for artists and art enthusiasts, allowing people to connect through the creation and sharing of art. 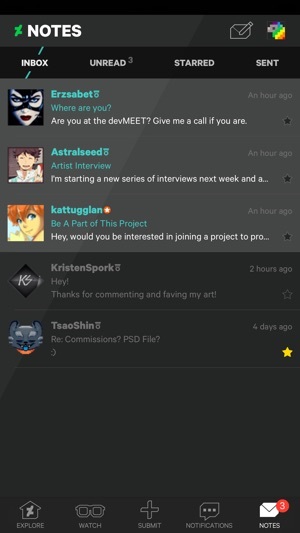 The DeviantArt Mobile App allows you to browse endless streams of content, as well as submit art and interact with the community 24/7. · Watch – a personalized and easy to access feed of every journal, collection, or status update posted by those you watch. 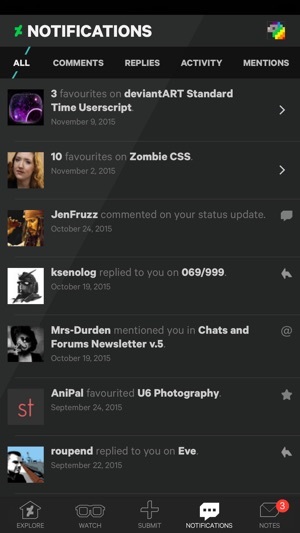 · Notifications – the communication center of the app, where you can manage all comments, mentions, and replies. · Notes – chat privately with your friends and favorite artists. 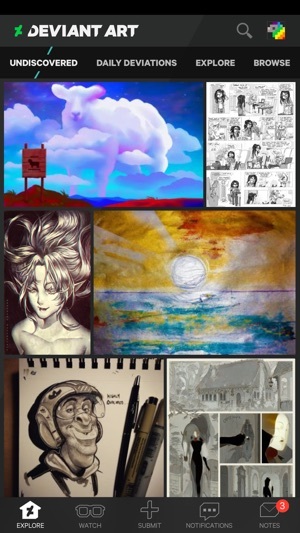 · Submit – submit art and literature to DeviantArt or compose a quick status update. · Undiscovered, Daily Deviations, and Explore – liberate and inspire yourself with browse modes comprised of extraordinary images drawn from an art collection powered by 37 million artists. · Status Updates – post short updates in a simple and direct format that lets you create informal conversations with your watchers. I love the app most of the time, but if there was one thing I'd like to change it would be this: I wish the app could allow me to save drafts of my fanfictions and allow me to edit them even after they've been published. It's very frustrating that I can't correct a simple error in my work (I am human and sometimes autocorrect messes up what I was trying to say. Ex. I type 'front' and it somehow thinks that I want to say 'from'. But I wish I could save some of my fanfics on my phone so I can return to them. I know I can correct them on the computer; but unfortunately, my computer is slow as dirt. And it freezes every so often. Also the other problem with no being able to save your work is that: I can't make a rough draft and take a break from it to finish it later. Sometimes I need a break from writing so I can gather more ideas. I'm only human and I've been faced with writer's block. So I implore the creators of this app to try and create some way to save our work on our accounts no matter what platform we are using. 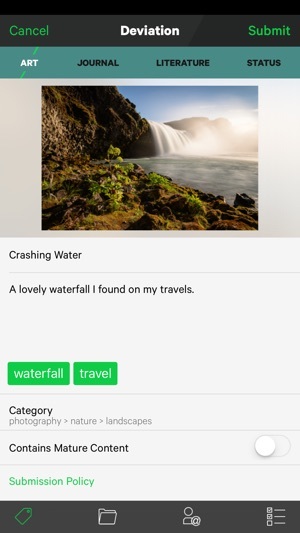 Thie mobile version of the website is, overall, alright; you are able to view profiles, yours and others, and look over your notifications, but it is only the feedback that you are able to delete. One thing I have noticed is that once you edit your personal info, such as your tagline, directly from the app, the deviantID widget is—if you haven't already done so—added to your profile when you view it on the computer. It can be quite annoying. You also seem to be unable to delete or edit your deviations/statuses from the app, as if they were read-only documents. This can be quite inconvenient, especially if you want to edit or delete your post and don't have a computer near you. I have checked the updates, and it seems that this has not been updated in two years. Now, that is an awfully long time to leave it be when it has all this potential to become a better mobile version of DeviantArt, as guided by the reviews given to the app. It will not, if the developers are unwilling to take these reviews into consideration. 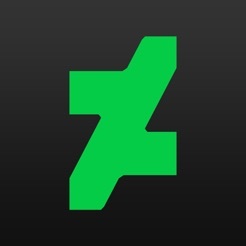 © 2000 – 2016 DeviantART, Inc.